John Calvin had clear thoughts on which matters of the Christian faith are and aren't worth arguing about, Reformation scholar John L. Thompson told an audience at Samford University's Beeson Divinity School Tuesday, Oct. 29. "Calvin would say that after worship and salvation, everything else is secondary," Dr. Thompson said of the 16th century Protestant Reformation theologian and pastor. Those two necessary or "essential" elements speak to the "soul" of the Christian church, Thompson said in the first of three Reformation Heritage Lectures at the school this week. Other elements fall into one of two categories: "important," or "indifferent, non-essentials." Thompson cautioned against linking essentials and non-essentials, or taking small issues and sticking them to a larger issue, such as disputes over the Lord's supper or infant baptism. "In Calvin's view, baptism was important and the form of baptism was less so." "The Reformation was never intended to be a schism," said Thompson, a professor at Fuller Theological seminary in Pasadena, Calif., and author of a respected recent book on the history of exegesis, Reading the Bible with the Dead. Regarding worship, "Our duty is to credit God for all that is good, and turn to God for all that is God. God should be the center of our worship," Thomson said, adding that Calvin was suspicious of filling church time with theatrical diversions and ceremonies that drew attention away from God. "Calvin is clear that the gospel is about God." Salvation plays out in three stages: the knowledge of sinfulness, acknowledgement of Christ as the only source of freedom, and a Christian maturity of resting in Christ. "Salvation matters, so sin also matters," said Thompson. "Salvation can make little sense when a person sees nothing to be saved from. To know oneself as a sinner for whom Christ died is the greatest thing." The "essentials" correspond to the beliefs that Protestants have in common with Catholics, said Thompson: "Those that make us all catholic with a lower case 'c.'" Calvin's "important" category included matters related to the "body" of Christianity, such as sacraments and polity, including infant baptism. "Calvin would say these are important because they are indicated by scripture," said Thompson, comparing them what distinguishes Protestants from Catholics. Thompson cautioned against letting such matters divide Christians. "Important matters are too important to ignore, but we should not allow them to split a church, or The Church." Non-essential matters are neither commanded nor forbidden by the Bible, nor morally good nor morally evil, and are not considered essential for salvation. They do, however, distinguish local congregations from each other. Thompson used the example of vestments worn by clergy, a 16th century post-Reformation controversy, and a matter on which the Bible is silent. Of concern was the kind of message sent to a Protestant congregation if their pastor looked like their former priest. If laity thought nothing had changed, they might think they could retain their old ways, and in some ways, vestments symbolized loyalty to Rome, said Thompson. Calvin, who wore a simple black robe, he said, didn't see the argument about robes as essential, "but important because it could cause others to stumble." It was an "accept, but work to change," matter. Thompson recently edited The Reformation Commentary on Scripture's volume on Genesis chapters 1-11. He is an ordained minister of the Presbyterian Church (USA). 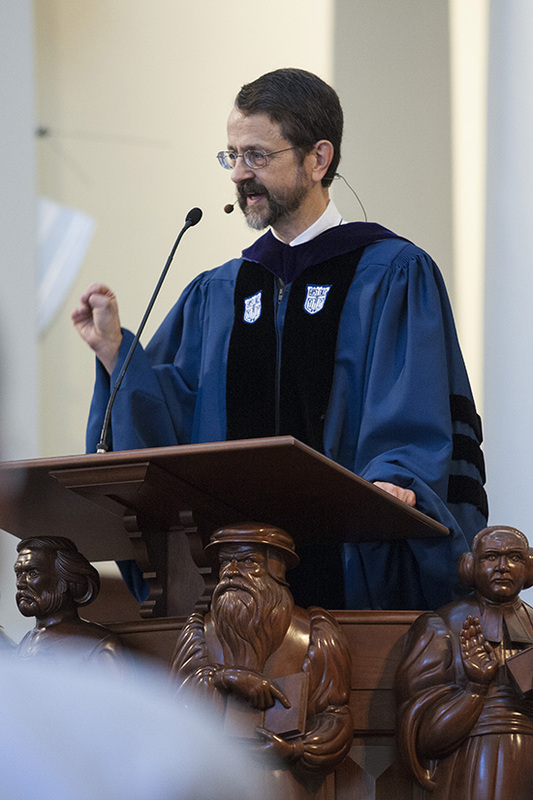 Beeson dean Dr. Timothy George noted that this year marks the 25th anniversary of the Reformation Heritage Lectures, the first of the annual lectureships that were established when the divinity school was begun in 1988. Beeson also presents the Biblical Studies Lectures and the Conger Lectures in Preaching during each spring semester.